This movie is awesome. I had no idea what to expect going in. Oh sure, I've been on the ride in Walt Disney World of the same name, but the ride has no central characters nor a plot of any kind. Rather it presents more of an atmosphere to the tune of a catchy song, "A Pirate's Life for Me." "Yo ho. Yo ho. A pirate's life for me!" In any case, I felt the movie would be a sad attempt to boost ticket sales in the Disney theme parks since they have been suffering as of late due to the September 11 terrorist attacks. However, I can now proudly and boldly proclaim that the Pirates of the Caribbean is the best movie of the year! This movie has everything: action, adventure, romance, suspense, humor, and fun. 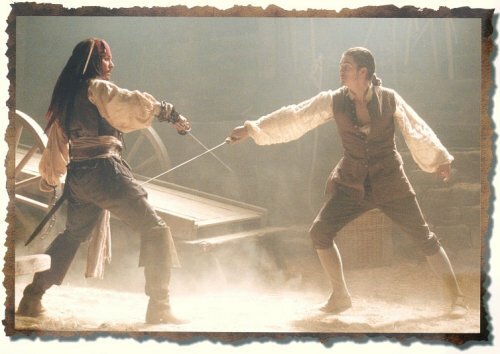 There is swordfighting, chivalry, piracy (how often do you get to say that one? ), and mystery. The story sets the stage for an eclectic trio of protagonists to find the heroes within themselves and overcome their numerous enemies with bravery, cunning, and surprise. Of these, we have Elizabeth Swann, a high-classed governor's daughter (played by super-babe Keira Knightley) and William Turner, a low-classed blacksmith (Orlando Bloom who is Legolas in The Lord of the Rings trilogy) who is actually the son of a pirate, much to his disgust. 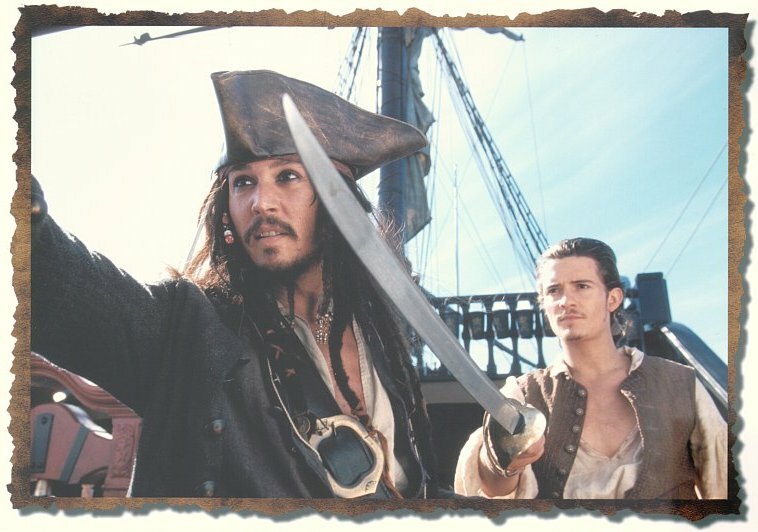 The real treasure of this movie, however, is found in Johnny Depp's performance as Captain Jack Sparrow (our third, but primary, hero). His character is unforgettable and definitely one in a million - make that a trillion. Captain Jack Sparrow is the former captain of the Black Pearl, a famed pirate ship that legend has it is under a curse. 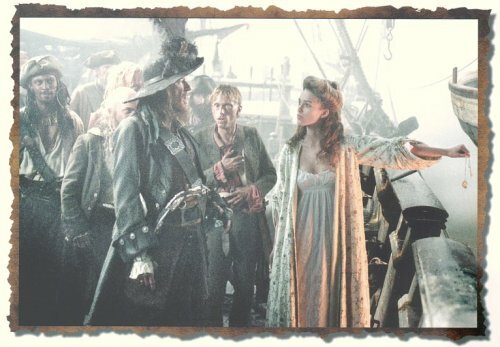 Captain Jack was the victim of a mutiny led by his then 2nd-in-command, Barbossa (played brilliantly by Geoffrey Rush, academy-award winner for Shine). 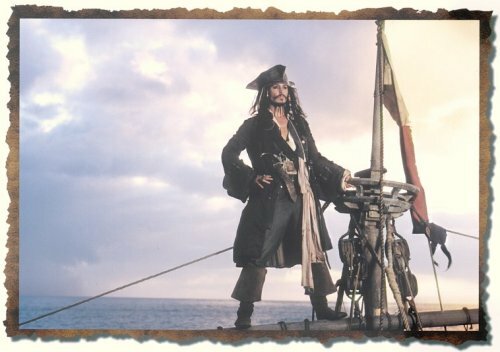 Anyway, Depp's performance as Sparrow steals, and leads, the show, as he attempts to steal (reclaim, technically), and lead, the Black Pearl. The lead characters are developed very well, but most importantly, along the way we are delighted to a cornucopia of movie magic and fun. There is even a bit of frighteningly haunting and good old-fashioned ghost story in here as well. This movie is sure to entertain, no matter what your tastes. As for what I perhaps did NOT like about this movie, I can only think of two things. The first has to do with its blatant political correctness. What I mean by that is that all races and genders seem to have an equal footing in this place and time depicted in the movie. However, any student of history knows that this was not how things were done back then. But then again, neither were there pirates that turned to walking-dead skeletons under a full moon. So this I can forgive because this movie's purpose was not to take us back to our past from years ago, but to take us to somewhere we've never been. What I cannot forgive, however, is the corniest line that I've ever heard in a movie. Here we have the lead girl, Elizabeth, beating up on a pirate (again, not very realistic) when he questions her tolerance for pain. She answers back, "Pain? You want pain? Try wearing a corset." or something to that effect. Alas, I can write no more for the line speaks for itself. In any case, despite my two little criticisms, I thoroughly enjoyed it and can hardly remember a time when I've had more fun watching a movie. This year there have been a lot of other films more hyped than this one, but I'm telling you that this is the best of them all. If you only see one movie this year, see Pirates of the Caribbean: The Curse of the Black Pearl. A swashbuckling adventure! See this movie, or walk the plank! 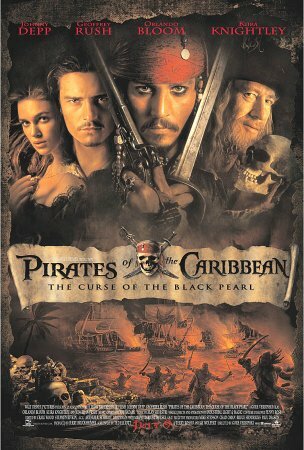 How would you rate the movie Pirates of the Caribbean: The Curse of the Black Pearl? There have been 137141 people to visit this page since Fri, Jul 11, 2003. And you are the first person to visit this page today!